Mystère by Cirque du Soleil provides a complete spectrum of awe-inducing entertainment with colorful sets, imaginative costumes and highly-skilled performers. A gigantic baby? A humongous, inflatable snail? OK, you’ve got our attention. Like fine art, the storyline of Mystère at Treasure Island is left up to individual interpretation. But one thing about this production is for sure: this show, which also happens to be the first Cirque du Soleil production in Vegas, is so entertaining you’ll want to stay for an encore after the final bow. Oh, and speaking of the performers, the show features an international cast of 67 artists that are the ultimate example of “don’t try this at home.” We always wonder whether or not these crazy-talented performers are even human. They fly, they muscle up poles like tree frogs and make us feel pretty bad about not being able to touch our toes. They’re friggin’ amazing, and they have no fear and apparently no bones in their super-bendy bodies. Performing stunts like quadruple flips off teeterboards and other eye-popping tricks we average folk couldn’t dream of if we tried, this show is so unreal you just kinda have to let it happen. 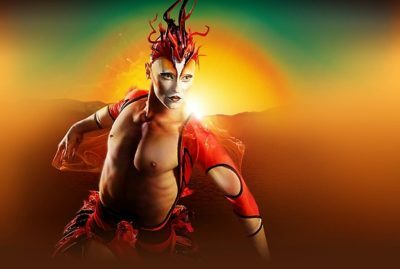 Emphasizing family-friendly, awe-inspiring athleticism and imaginative imagery, Mystère embraces all the signature Cirque du Soleil elements that have made this show one of the must-see productions on the Las Vegas Strip.